The plays were staged in York Minster from 26 May 2016 (the feast of Corpus Christi, the date of the medieval Plays) to 30 June, the longest-ever run. The Dean of York said the Minster had been privileged to be the Plays' guardian for a season. Director Phillip Breen and producer Nicky Corp recruited actors and actresses from across the region both to take part in and to support the production: there was only one paid professional actor in this production, Philip McGinley, playing Christ - local people did the rest! Here is a link to a castlist. Here is a link to the list of creatives. Over 200 were selected for named parts (many regular York amateurs and some young professionals) and the chorus. Some 50 were children/young people. Another 200 people took roles such as administration, building the set, making props, or as wardrobe assistants, seamstresses, backstage crew, steward. 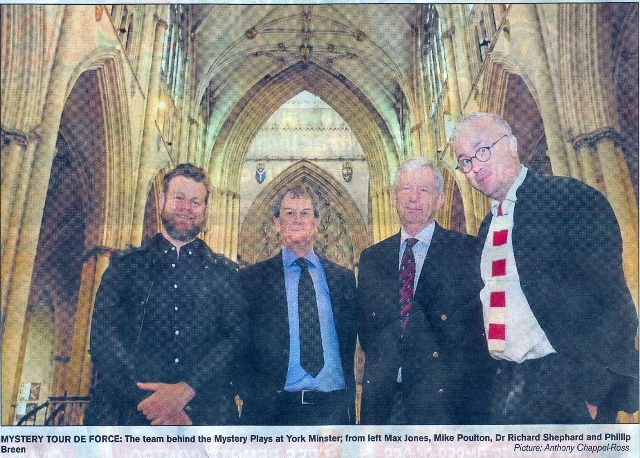 This picture shows designer Max Jones, scriptwriter Mike Poulton, musical director Dr Richard Shephard and director Phillip Breen in the Minster, planning the 2016 production. 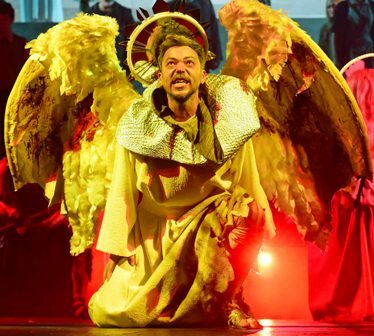 Over 26.000 people saw the 41 performances, about 65% of the possible sales. The above York Press cutting is among those in the NCEM archive. Here is a link to the castlist. Here is a link to the page listing Creatives. Below are Ehren Mierau (left), who played Judas and Toby Gordon (right), who played Lucifer/Satan. 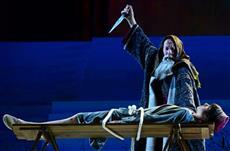 Here Abraham (John Roden) lifts a knife to sacrifice his only son Isaak (Ewan Croft). God sends an angel to stop the killing, having tested Abraham's faith. After the Plays were over, there was an exhibition in the Minster spotlighting the Plays and their message. See below a link to a page about that exhibition. 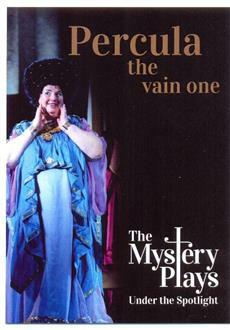 Here is Elizabeth Stanforth Sharpe, Dame Precious Percula (Pilate's wife), as depicted in the exhibition. See this page for photos of the 2012 production in Museum Gardens. See this page for the 2018 wagon plays, and this page for images of musicians in 2018.